Located in northern New Mexico, Angel Fire and Taos are a unique duo. Just 30 minutes from each other, they provide a unique combination of high-desert and high-alpine riding with the added bonus of a world class mountain bike park. 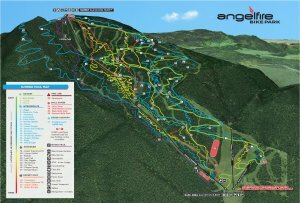 Angel Fire features 96km of purpose-built terrain: skinnies, jump lines, manicured flow and super chunk trails. This is the place to experience high-elevation riding with classics that take you through aspen and pine forests, wide open meadows and wicked descents. Angel Fire and Taos mountain biking landscape offers an adventure of a lifetime. Home to rugged mountains and scenic valleys and famous for its mountain bike terrain its blend of history is unique to this part of the world; a history of Ute Indians, miners, ranchers and Spanish influences with Angel Fire getting its name from the native American Indians for its fiery lights on the mountain peaks. Northern New Mexico’s landscape includes 13th century Pueblo dwellings, sheer-walled canyons, singletrack trails, lonely forests, meandering amongst its highest mountain rising to 13,161 feet. New Mexico is a place of strong Native American and Spanish influences with a colourful history as exciting as its mountain bike trails to test and excited all two-wheeled enthusiasts. Angel Fire sits at almost 3,000 metres and Taos down at 2,000 metres, so you’ll get a variety of full on mountain biking experiences featuring long rides, big climbs and big descents. Angel Fire Bike Park opened in 2001 and offers 96km of trails and purpose-built, lift-served mountain bike terrain. Surrounded by wildnerness this high alpine terrain incorporates old mining roads with mountain singletrack. Some terrain is steep leading to exciting downhills. Trail offers lots of different routes from easier shorter loops to longer rides. This challenging route starts and ends in Angel Fire. Expect long ascents and graceful descents. Angel Fire and Taos are located in southwestern Colfax County, New Mexico. Angel Fire and Taos has a variety of accommodation options to choose from.